Landscape painter son of Alexander George Fraser. He studied at the Trustees Academy. Until 1857 a year before he was elected ARSA (RAS1862), his subjects were principally Scottish but in that year he visited Wales and for some time Welsh landscape engaged him. 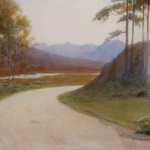 He thereafter returned to paint some of his finest Scottish landscapes including Calzow Forrest and on Loch Lomond. During 1868-1869 he painted in Surry then returning to Scotland for the last 15 years of his life. He exhibited at the RA from 1869-1855.